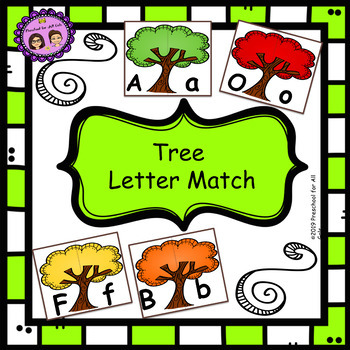 Make learning about letters and their sounds FUN with this engaging Tree Letter Matching game. It is a hands-on game to help students identify lowercase and uppercase letters. Students can also practice letter sounds. This is great for literacy activities in teacher-directed small group or student led group. How to Play: Students match uppercase to lowercase letters. 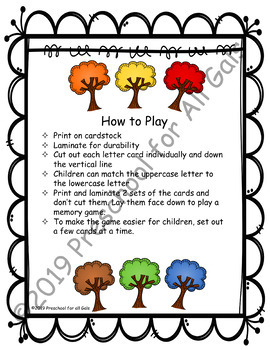 Students can also play a memory or matching game. 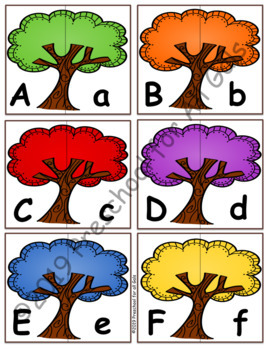 Print 2 sets of the alphabet cards and do not cut them. Lay the cards face down or face up to play these games. Depending on the level of the student, use a few cards at a time and then increase as you see fit. Printing Tip: Depending on your printer, you may need to set your printer settings to “scale to fit paper” so that the edges do not cut off. Also you may need to click on "US Borderless" under paper size, if you have this option, to eliminate the white borders. This product is for personal use/ single classroom use only. No part of this product may be distributed, transferred, edited, or shared in any form.